I’m not picking up my toys for forty-five cents. Even though it was close to 25 years ago, I remember that chore chart affixed with Disney magnets to our white fridge. My dad had broken apart every chore in our home, assigned it a monetary value and created this perfectly organized chart. If I did every chore on it, I would earn $2 a week. That amount seems small now, but at the time, my 10-year-old self was pretty stoked. So I scanned the list and decided to start with dishes. I quickly scrubbed the plates, bowls and silverware and placed them in the drying rack. It took me 20 minutes. Yes! I went back to the list and check it off. Fifty-cents. Already…I was done with this. Fast-forward a week later and that was the only box I completed on the ENTIRE chart. Not that my parents didn’t encourage, Oh.. they did! But, I never did. In a few weeks, the chore chart quietly disappeared and my parents never brought it up again. Why did the reward system fail? Humans are tricky creatures and as much as we think we’re motivated by external rewards, we’re not. Sure, they work in the short term. Pick up the house and we’ll go out for fro-yo. Done. Once you put away the dishes we can go swimming. Alrighty-then. But as a long-term solution, external rewards don’t work. This goes for every human – kids and adults. Why? Because it becomes the responsibility of the person giving the reward to encourage the behavior. The behavior stops as soon as the reward stops. And if the reward was never that appealing to the individual to begin with, the desired behavior fails to launch. As much as our society wants to convince us, people simply aren’t motivated by money and external rewards. Know they have the necessary skills to meet the challenges. 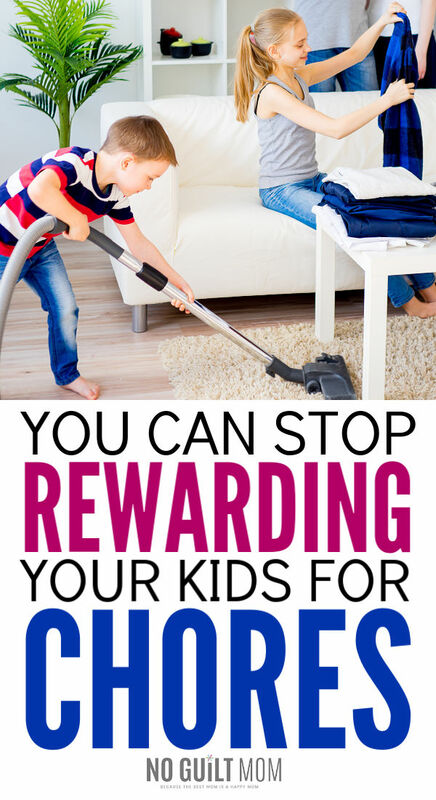 Simply posting a chore chart with a reward system – whether it’s money, prizes, or treats – doesn’t work because there is no sense of family community -it becomes a pay for play – and sometimes kids are being expected to do something they have not yet developed the mental skills to achieve. So, why do we resort to rewards? Ready for the bomb drop? When we parents create a reward system for our kids to do chores, its us trying to exert control over the situation. Kids learn nothing about managing their own behavior through rewards. How should we get kids to do chores? We need a system that not only shows kids that expect them to do chores but also guides them in achieving them. Teaching how to recognize the rewards for a job well done. Is this harder than posting a list? Most definitely. But the effects last much longer. We want chores to become a habit, not a task we need to constantly nag our children to do. Because who likes that? I want to scream if I have to ask my kids to do something more than once. I feel like I’m talking to brick walls. I start the conversation with: I expect you both to unload and load the dishwasher every day. When do you want to do it? If it’s immediately when they come home, we think of a cue that will remind them it’s time to unload. For example, my son always comes into the house and wants a snack. After he finishes his snack, that will be his cue to unload to dishwasher – in other words to complete the action. All these rewards occur naturally with no intervention from me necessary. All the control is in my son’s hands and that releases me from constantly nagging. The job gets removed from my plate. What happens if they don’t do the chore? Since this is all about the helping the family, it becomes personal when kids don’t do their chores. They won’t get to eat on time because there will be no dishes. I can’t help them with something because its taking me much longer to make dinner as a result of not having clean dishes. They don’t have control over their free time because they get zero TV/ electronics privileges until their duty to the family is met. As parents, we have much more control than we give ourselves credit for. It doesn’t need to involve money or rewards. With these consequences, kids internalize responsibility, develop empathy for others, and discover the real results of their actions. No chore chart or complicated reward system required.